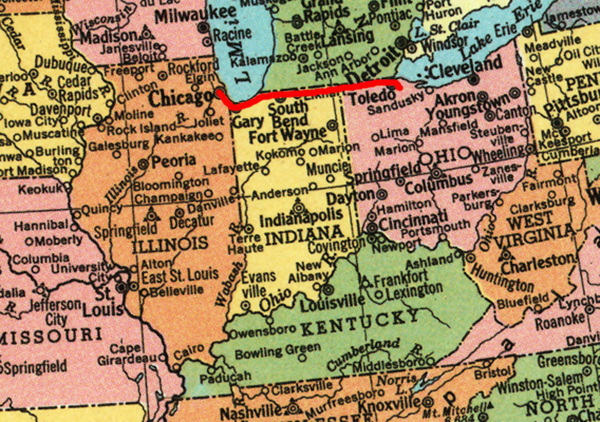 We drove northwest through Perrysburg, Ohio, another prototypical American small town, to Toledo. We stopped in a used bookstore, and the owner told Kyle and I about how the woman who wrote all the Nancy Drew mysteries, Mildred Benson, was a native of the city. The bookstore owner had a few antique copies of her books autographed. When I went back a few years later, the store was closed. Following U.S. Route 20, we eventually made our way into Indiana, where the drive was peaceful and relaxing. Our first stop was in Angola, where Kyle and I visited a CD store. After driving past a menacing nuclear power plant in Michigan City, we hit traffic in the Hell-On-Earth city known as Gary, Indiana. I would rather live permanently in Iraq before ever going through, driving by, Gary, Indiana. 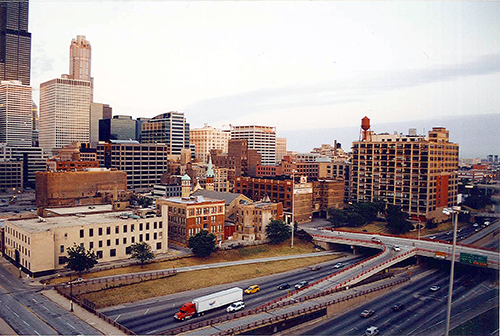 We were caught in traffic until we were able to drive off an exit ramp into the edge of Chicago, Illinois, where Kyle and I checked into a Days Inn and then filled ourselves up in Greektown. It was an early night for us ’cause we both knew we wanted to experience the city when the workday began. Bogey’s Diner on U.S. Route 20, somewhere between Clyde and Fremont, Ohio. 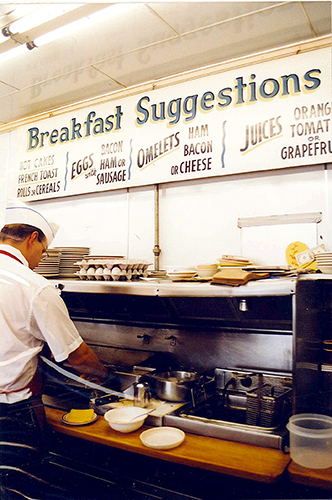 The food was good and our fellow diners kept the conversation going. July 8, 2001. 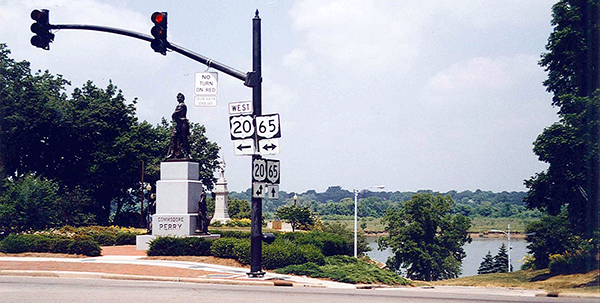 Perrysburg, Ohio, stands on the banks of the Maumee River. 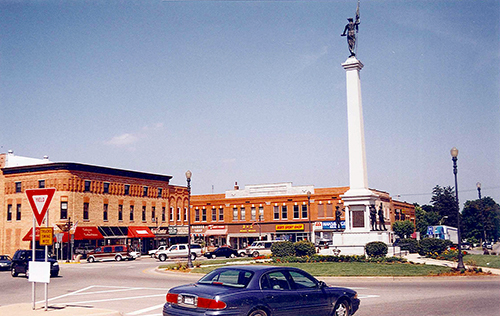 The center of town was on the verge of a revival, but in 2001, it was just dawning. July 8, 2001. 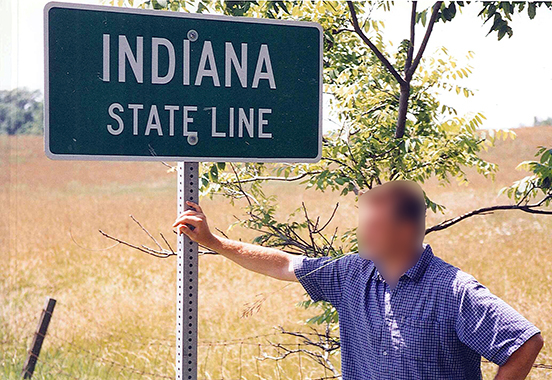 Kyle stands on the Indiana state line. The wheat and soy fields continued to line Route 20, but so much was broken up by dead factories and roadside death. July 8, 2001. There is nothing comforting about entering a town and being greeted by a nuclear power plant. This one looms over U.S. Route 20 in Michigan City, Indiana. July 8, 2001. 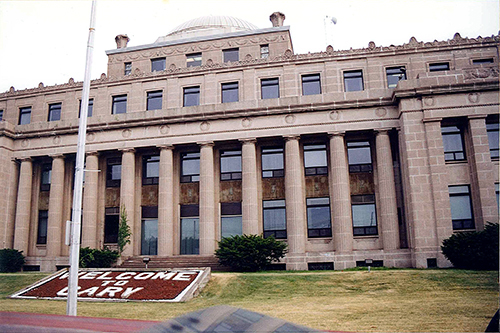 City Hall, Gary, Indiana, birthplace of Michael Jackson—and it makes sense. In mid summer 2001 there were metal barrels on Main Street sending black smoke and flames into the air just under the awnings of closed businesses. July 8, 2001. Kyle and I arrived in Chicago around 8:00. After checking in to the Days Inn, we headed over to Greektown for some lamb, grilled cheese, and Ouzo shots. July 8, 2001.